United Nations, New York, USA, January 02 2018 – Nikki R. Haley, Permanent Representative of the United States to the UN, speaks to journalists about developments on the Korean Peninsula and in Iran today at the UN Headquarters in New York City. The U.S. Mission has requested a UN Security Council briefing on ongoing developments in Iran for 3:00 p.m. tomorrow. “Tomorrow the UN Security Council will discuss the troubling and dangerous situation in Iran. The world has witnessed the horrors that have taken place in Syria, that began with a murderous regime denying its people’s right to peacefully protest. We must not let that happen in Iran. This is a matter of fundamental human rights for the Iranian people, but it is also a matter of international peace and security. 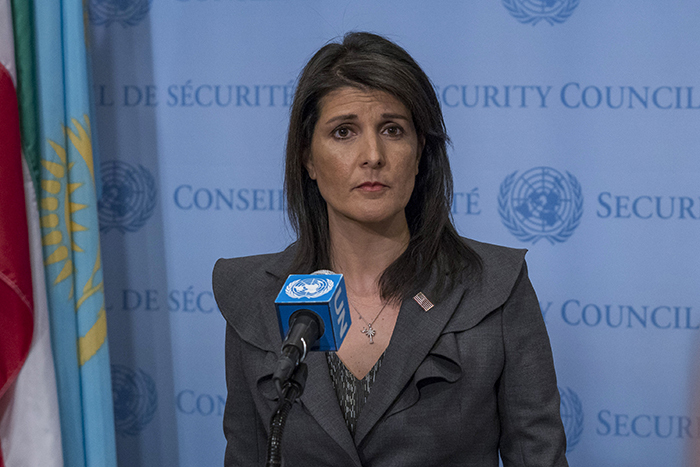 It will be telling if any country tries to deny the Security Council from even having this discussion, just as the Iranian regime tries to deny its own people the ability to have their voices heard,” said Ambassador Haley.